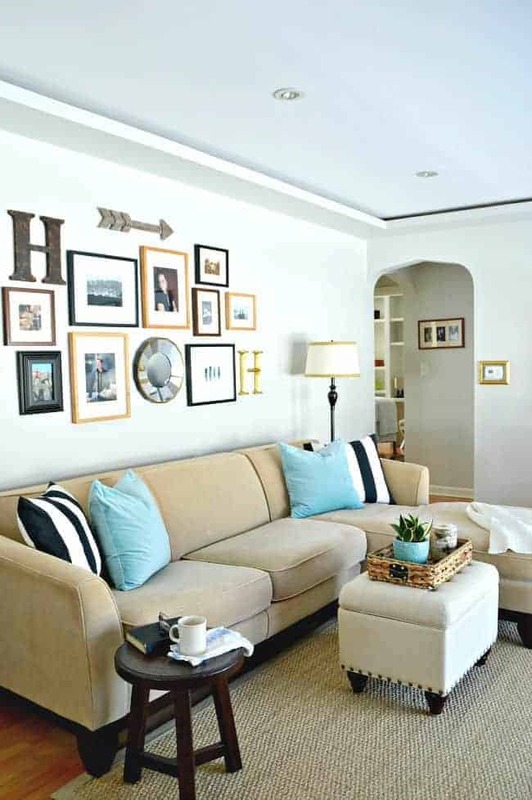 Tips on how to buy a couch for your living or family room. Now that we discussed the issues I faced in the bedroom, umm…I’m talking about our mismatched bedside lamps, I thought I’d move into the living room and share our new couch and a few shopping and buying tips I’ve learned after buying several sofas over the years. 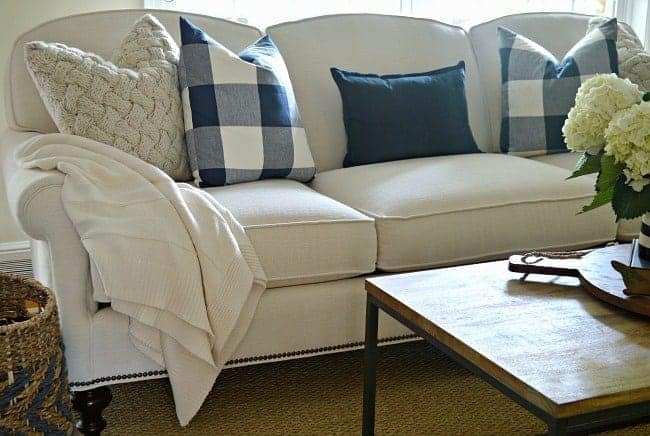 We never had any intention of buying a new sofa when we moved to North Carolina but, once we moved into the new house and placed our furniture in our small, awkward living room, it became apparent that the sofa would have to go. It was just too big for the space and partially blocked the doorway into the guest bedroom, plus there was no room for any other furniture (like the hubs’ ugly recliner). Anyway…The sofa that we had, a sectional from Pottery Barn, was purchased about 13 years ago after a ton of research and comparison shopping. I knew that I wanted something that was built well and would stand the test of time and, although it was expensive, it held up very well. The only thing I ever really did was to replace the couch cushions right before we moved to NC. It ended up being a good investment all those years ago. When it came time to look for a new couch for this house, I went back to the lessons I learned the first go-round. I picked a great one last time so I was confident that I could do it again. 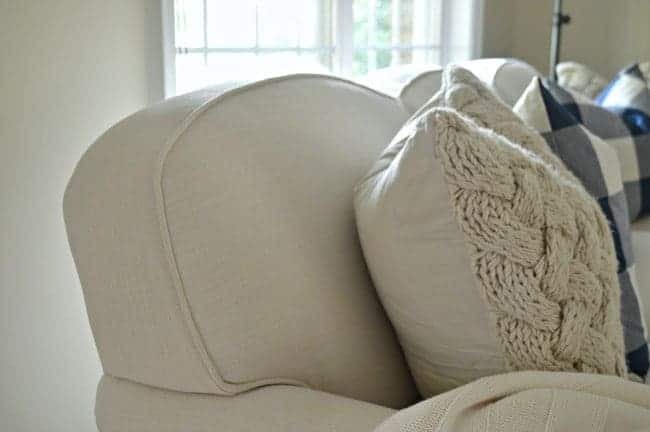 I’ll admit it, I usually love to go shopping when I’m buying things for the house, but shopping for a new sofa isn’t one of the things I get excited about. I think it’s because I know I’m spending a lot of money on something that I need to love for years and years, and it has to be done right the first time. Ugh…so much pressure! But I just took my time, carefully went down each item on my list, one at a time, and came out with a winner. There are literally thousands of sofas out there in all different styles and price ranges. My purchase was on the pricey side but I was going for quality and durability over the long haul. My focus is on buying the best quality for your price range, whatever it is. Know what you are buying, buy what you can afford and buy it because you love it . Before we get to that, there’s a few things you need to do first, before you go to the store. You should have some kind of idea what you want before you go shopping. Look online at a lot of different styles and fabrics to see what appeals to you. Measure, measure, measure!!! Make sure you measure your room so you know exactly what size couch you need and how it will work with your existing furniture. I even make a rough drawing of furniture placement so I know where everything will go. Also, make sure you measure doorways and stairways so you know how much clearance you have. You want to be able to get your new sofa into it’s new home, right? Now you’re ready to shop!!!! I’m lucky to live in North Carolina, where we have so many awesome furniture manufacturers. I knew exactly where I was going to do my shopping…at the Hickory Furniture Market. Oh.My.Goodness…talk about overwhelming. There’s so much to look at and you could easily get distracted by all of the lovelies, but we were only looking for one thing…a new sofa. I usually walk around and do a quick inventory of sofas. Feel fabrics, sit on sofas with shapes that appeal to me and narrow down my choices. When I find a few that I like in my price range, and they are comfortable to sit and lay on (I sit and lay every which way when I sofa shop), I start to look at the way it’s made…the construction. The sofa should be heavy, as in, it feels heavy when you lift it. The frame should be made from a hard wood, like oak, birch or maple (that’s what makes it so heavy). Soft woods, like pine, can warp. Eight-way hand tied springs are considered best. There are machine tied springs that are considered good but I prefer eight-way hand tied. Built-in legs tend to be stronger. Removable legs may be necessary if you need to get your sofa in a tight space but built-in legs are best. Lift the cushions, check the quality of the decking, push on the springs. Speaking of cushions…pick them up. A heavy cushion usually means a quality foam was used, which is good. A lot of upper end sofas use down wraps around foam for comfort. Consider your seat cushions. Should you have 1 long cushion? Two or three? I tend to go for three. Do you want a skirt on your new sofa or open legs? I have a small space so I like to have open legs. Also consider the arms and the back. Do you want loose cushions or a tight back. I’ve had loose cushions before and they drove me crazy. The constant fluffing and fixing was a real pain. My PB sofa had a tight back and I loved it, so I went with that again. 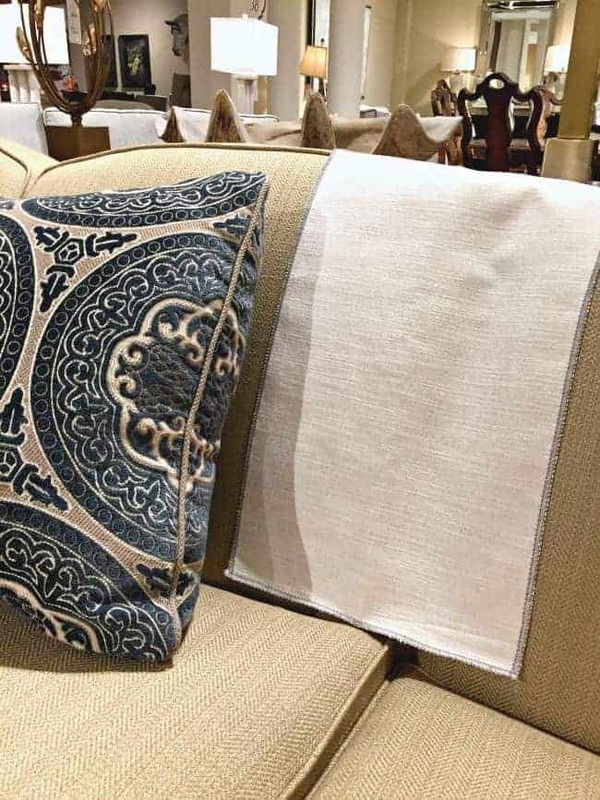 Once you’ve decided on shape, size and cushions, it’s time to pick fabrics and finishes. I’ve had a colorful, striped sofa before (does anyone remember when jewel tones were all the rage?) so I knew that I needed to stay in the neutral family so that it would be in style for years to come. I like to bring my color in with throw pillows…lots of throw pillows..which can easily change the look of your sofa, and your room. I think that picking out your fabric is the hardest part of this process. Everyone has their own wants and needs but I tend to go for something durable, with a tighter weave. A fabric that can easily be cleaned when the inevitable spill happens. My PB sofa was supposed to have a durable fabric. It was great, for the most part, but if something spilled on it, you could see where I wiped it up. It didn’t matter if I scrubbed, brushed or blotted, you could see the spot. It’s the reason I was so focused on getting a fabric that could withstand cleaning. After all was said and done, I ended up going with the Taylor King Holmes sofa and it seems to be excellent quality. We also went ahead and purchased a warranty for spills on the fabric. I don’t usually buy a warranty but when you’re spending a fair amount of money on a quality piece of furniture, it’s a good idea. I’ll be sure to give an update to share how it’s holding up. This room is still a work in progress and photos have proven difficult with the lighting, but it’s looking so much better than when we moved in, and there’s more room for my other furniture (with the sectional out of the picture). It’s a big investment and you’ll have it for a long time, so you have to love it. Completely…no doubts…no reservations. 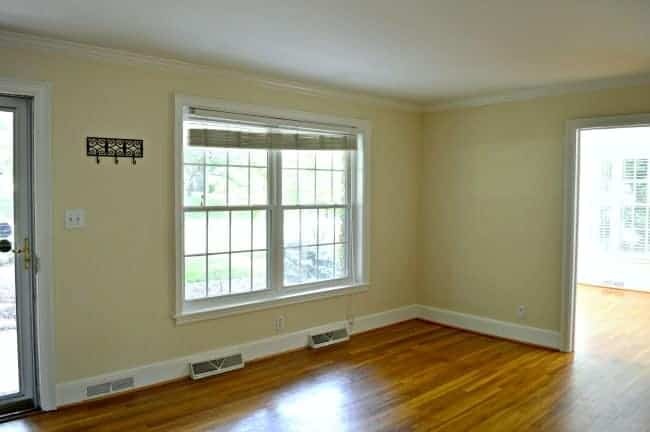 Any tips you’ve learned from buying a couch? Thanks for those couch upholstery tips. I didn’t think to just get the fabric reapolstered after so many years! 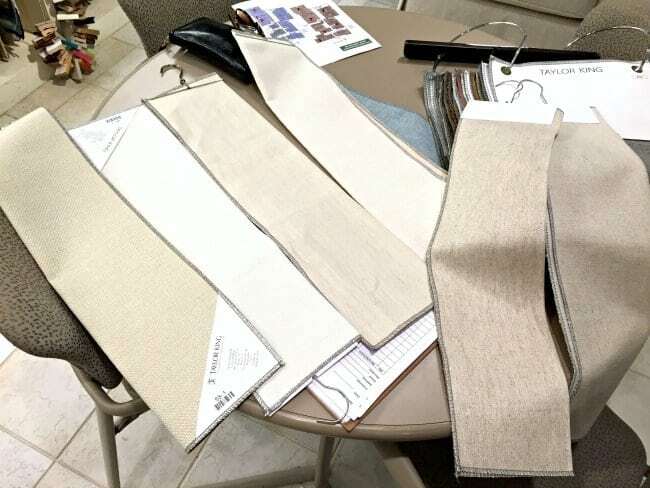 Do you have any more tips around finding the right color of fabric for a space? Thanks! I couldn’t agree more with the article’s suggestion to measure everything before you actually start shopping for a new sofa. You do not want to be guessing the size of the space you’re trying to fit the new sofa into while you’re at the store. You might be able to get it right on the first time, but it is likely that you’ll be returning the sofa soon for something smaller. We are getting ready to replace our living room furniture too, and I am happy you covered this subject. Our old set is at least 25 years old and still in very good shape. Its in a simple large plaid of hunter green, beige and burgundy so you know what time frame we bought it in. I still love the colors even if it is way out of date and a little dark. (Heck if we wait a little longer it will come back in style, you know “everything old will become new again.” lol) We purchased it at Lazy Boy. Its the first of two couches that we bought from that company. Both were excellent choices as to durablity. This old couch is so comfortable that we hate to give it up (especially my husband who keeps insisting there is nothing wrong with it), not to mention the material is really tough and hardly shows any stains because of the pattern. 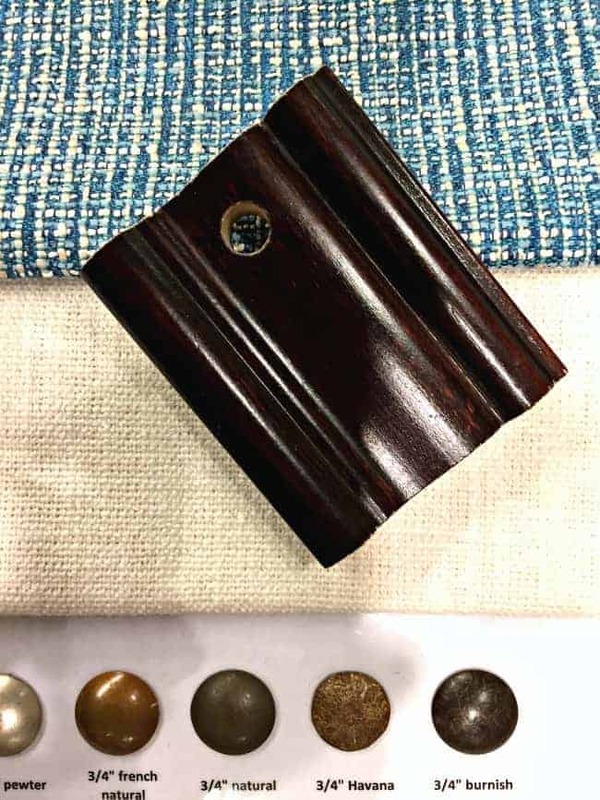 Years ago my mother showed me how to rate furniture by looking for things like drawers with dovetails, couchs with material patterns that lines up and matches and is placed under the sofa cushions as well, and hardwood frames. She was frugal, and had the same couch for years but always had it reupholstered/slip covered again and again. Her furniture was Duncan Phyfe, very classic, and of good quality. She had it for years. The wood was mahogany and beautiful tones and grain. She taught me that ” you get what you pay for”. And I also learned that fads come and go (like the Mediterranean and Southwest look, etc) so go with a more classic looking, longer lasting style. (Even with clothes) I have always thanked her for those little pieces of advice. I really enjoy reading your blog and you sharing all your ideas with us out here in Internet land. Keep up the good work. Its appreciated. Your mom was one smart cookie, Sue. I agree with everything she shared with you. They certainly don’t make furniture like they used to, quality wise, so it’s harder to find those good pieces. Best of luck with your new furniture purchase. I’m sure you will make an excellent choice. Great tips! 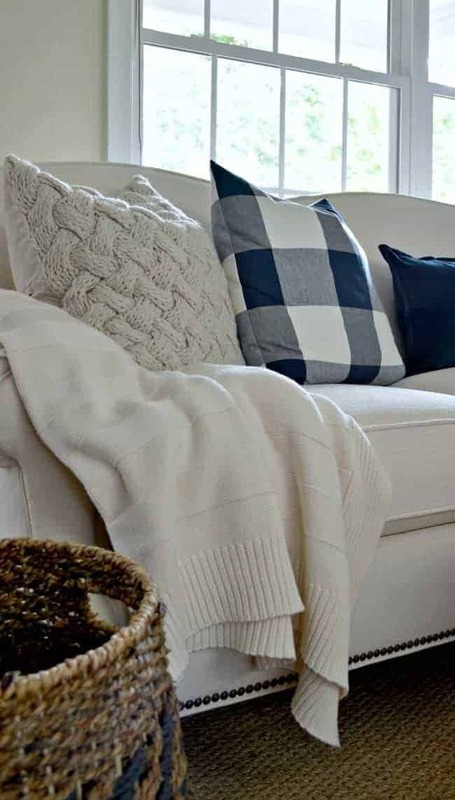 Love your buffalo check pillows! We have been married 34 years and are on our 3rd sofa. The first sofa was a horrible hand-me-down, but it served it’s purpose for a couple of years. It was smallish and the back folded back so it was sort of like a bed, too. Then came the plaid jewel tone sofa with matching love seat. It was not expensive, but it sure did hold up well and through 3 small boys. Pretty amazing. Thought they were several years old and we were tired of them, they were in adequate condition to be sold to someone. Then in 2008 on Election Day, (I remember it because we were both off from work and used the day to shop after voting) we made a very well thought out and expensive purchase of Mitchell Gold neutral tan slipcovered sofa and loveseat. I still love them as much as the day I bought them. I have had the slipcovers dry cleaned once. They could stand to be cleaned now, as a matter of fact. One thing I have done recently is add poly batting to some of the cushions–the ones that were flattening. 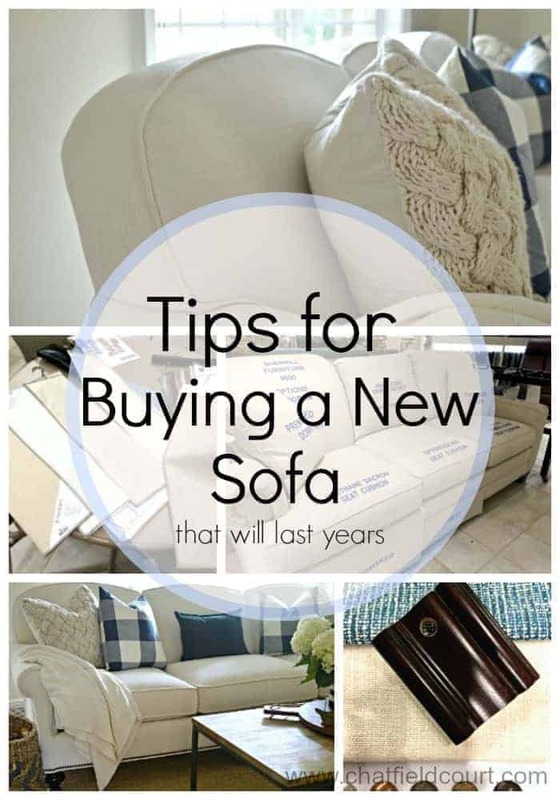 I totally agree–a sofa purchase is very important! It sounds like we’ve been on a similar sofa journey, Melanie (right down to the jewel toned sofa). 😉 I just hope that I’m still loving my sofa years from now, just like you love yours. Thanks for sharing your experience! Oops! After I hit “send” I realized there was actually another sofa in the mix. I had forgotten about it! Our second sofa was actually a tan background with colored threads peeking through. That was during the peach and hunter green stage of the 80s! Thanks Rosie. I was nervous about the fabric because of my last sofa so I tried to pay special attention when picking it out. I’m honestly not sure how it will hold up but it’s “supposed” to clean up and it is treated. We also bought a warranty on the fabric, just in case. I don’t have grandchildren but, if I did, I might have made a different choice. Not very helpful, I know. I’ll give an update on it’s performance after the holidays. Thanks for your question. Hi: I LOVE the sofa, great choice! Isn’t the furniture market just the best? When I lived in Charlotte, I worked for a high end furniture store, and got to go to “Market” a couple of times with the showroom designer I also did some dried arrangements for Virginia Metal Crafter’s and took my pay in merchandise.That’s how I got my delft Carolina tobacco jar which I dearly love. 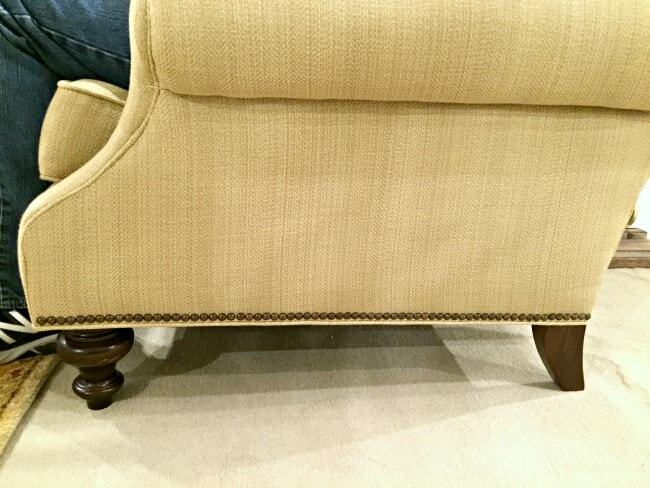 I bought a Sherrill sofa very similar to the one you purchased only it was a sleeper (talk about being heavy!). I had it for 20 years and it wore so well, I imagine it is still going. Any way, sorry I got carried away……I love your long posts as I imagine everyone else does too, so bless us anytime. Have a great weekend. It is a great place to shop for furniture, Brenda. I feel lucky that we live close enough to be able to shop there. 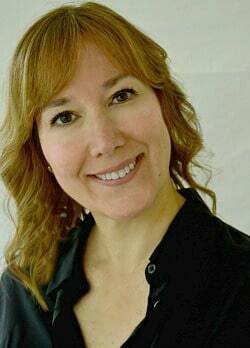 Thanks again Brenda, and I hope you have an awesome week!!! Ah! It’s beautiful! I love the scallop-y look to the top! When we bought our sofa, it was kind of a “hey, you need a sofa, let’s buy you a sofa” from my parents, lol, so we just went to Big Lots and ended up with a giant sectional thing. We like it well enough, though! Was alright to get into our last apartment, but we had to literally shove it through the door in our new house (and half of it had be brought in the back door!). We’re not planning on moving for more than a few years, though, and the way it’s going/shape it’s in, it probably will only last that long – that’s Big Lots quality for ya. The best parts about the sofa we have, though, is that for one, the cushions don’t come off, so that means the dogs can wrestle around and the couch won’t be in shambles when they are done. And two, it’s a faux leather, so the dog hair and drool, etc, just wipes right off and doesn’t show that they’ve been wrestling, ha! Thanks so much for stopping in Jessica, and I hope you have a great week! Beautiful choice! I am sure you will love it for a good, long time. I like the style you selected, and also the fabric and color. I also like the nail head trim. It is very similar to my sofa, and I agree a tight back is the way to go. I have a very similar style, but in a camel color and I have found that it not only hides dirt, but goes with a lot of different colors as I like to change things up quite a bit. 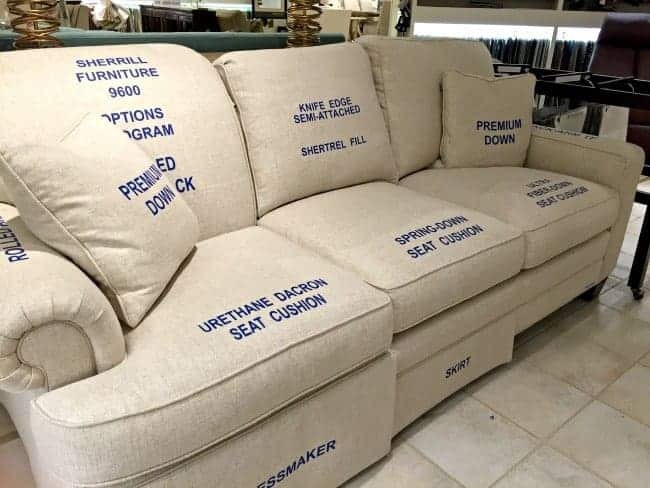 It sounds like you know how to pick out a sofa. 😉 It’s taken a bit of trial and error for me, but I think we’ve got a winner. Hope you have a great week, Patrice! I did the same thing, Debbie. I loved the fabric I picked out but, when I wanted to change my decor, I was stuck with this big colorful couch. Ah…live and learn right? Thanks so much for stopping in and reading. Hope you have a great week, my friend! Great tips Kristi, I need a new couch…..and the choices are overwhelming! I think yours looks great. Did you go with the Sherrill ? Thanks Kathie. The choices are overwhelming and I had a couple of panic attacks going through this process. 😉 I didn’t go with the Sherrill, I went with Taylor King. My husband and I are tall and their style and size just suited us. All wonderful tips dear, I will go back to this post when the time comes I need a new one! Your choice is perfect btw! Thanks so much Vel. Hope you have a great weekend!